People with active lifestyles know the importance of preparing before physical activity. Stretching, hydration and proper attire or equipment all play a factor in smartly and safely engaging in any athletic endeavor. And while most people take proper precautions to ready their bodies, the environment in which they are engaging in activity is often overlooked. Hard, unsupportive floors do little to reduce the stress on our joints and musculoskeletal structure during impact activities like dance, gymnastics and calisthenics. During indoor contact sports like wrestling and martial arts, floors need to absorb the impact of falls in practice and competition. This is why The Foam Factory provides a full line of floor padding products to make sports and exercise safer, more comfortable and more fun. Utilizing a range of closed-cell foam types because of their density, resiliency and moisture-resistant characteristics, The Foam Factory can manufacture supportive floor padding for entire rooms, gym flooring, personal exercise pads and even components for specialized floor construction. Gymnasium floors and areas designated for activities like gymnastics and wrestling frequently use flexible and durable gym rubber. With a 4.5 pound density, this foam rubber is firm enough to support bodies in their full range of athletic motions while remaining soft enough to diffuse the impact of running, jumping and falls. This material is extensively used in weight room flooring and home gym flooring because of the support it can provide. Another quality of gymnastic rubber that makes it a superior floor padding material is its outer skin that provides an easily cleaned, water-resistant surface. The skin also provides a firmer surface to walk and move on, compared to the cushioning interior cells. Single sheets of gymnastic rubber are available as thin as 1/8 of an inch, and for custom thicknesses greater than 2 inches, sheets can be laminated together. The Foam Factory can cut custom floor padding in a variety of styles, giving the option of permanent or temporary padding. Foam can be cut into interlocking flooring tiles or mats, eliminating a straight seam where sections can separate, leaving areas unpadded. Using interlocking rubber tiles, removable and resizable play areas can be created for children in schools, daycares or even at home. They’re also excellent for temporary exercise floor areas. The Foam Factory can make interlocking foam tiles for soft play areas using their black gymnastic rubber or firmer, more supportive tiles from neoprene and gray or beige gymnastic rubber. The firmest exercise floor tiles would be cut from cross-linked polyethylene foam (XLPE) for the most supportive play area surface. For permanent installations, straight sections can be cut and a securing snap system can be installed on the bottom of the padding to prevent shifting and a vinyl cover can be added to cover seams and create a smooth surface. Additionally, The Foam Factory keeps all order requests and specifications on file, so should an order be placed for interlocking tile pads, even months or years later the original size and design will still be ready to be duplicated if more are needed. Other foams that The Foam Factory can manufacture for custom floor padding are closed-cell polyethylene and open-cell rebond foam. Polyethylene is a superior shock absorbing material that is also shatterproof and lightweight for use as flooring underlayment. Available in densities from 1.7 pounds up to 9 pounds, this foam excels in applications like dojos where balance and footing is required but the surface must still absorb full-body impact, all while not tearing. Very firm rebond foam is another floor underlayment option, with 7.5 pound density. This product also provides support to its users while softening impact and absorbing shock. As an open-cell foam, it is important to cover rebond to protect it from moisture. Sometimes a floor needs to maintain a hard surface, like in dance studios. For situations where rubber exercise flooring cannot be the surface layer, a special construction design called a sprung floor is utilized where shock absorbing material is placed under the flooring. The Foam Factory offers the components that make this setup so effective. Instead of placing the flooring directly on concrete or floor joists, sections of shock-absorbing foam are placed between the base and the floor to provide cushioning that absorbs impact. This greatly increases the give of a floor, while maintaining its rigid surface. The Foam Factory manufactures dense, 3 inch by 3 inch by 2 inch sections of XLPE for this type of construction. These blocks of foam absorb and dissipate the impact of steps, jumps and lunges without immediately transferring the energy back to the individual. This setup is also very practical for extra shock-absorption under the padded floors of dojos and gymnastic or wrestling areas. For smaller-scale personal use, The Foam Factory manufactures customized exercise mats and yoga mats in a variety of materials that can be cut to any size desired. Available in closed-cell gymnastic rubber, XLPE and neoprene, these pads and mats provide just enough cushioning to soften hard surfaces without compromising the balance solid floor provides. These foam workout mats can be wiped down easily for cleaning and will not absorb moisture, very beneficial for long-term use. These pads also have enough grip to not slide out from under the user during yoga poses and can be easily rolled up when not in use. Pads as thin as 1/8 of an inch are available, and may be ordered as thick as desired. 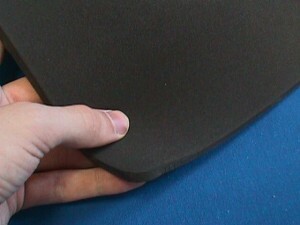 Additionally, XLPE foam is available in multiple colors for a customized yoga pad. Padded flooring for high-impact applications makes sense for many reasons. In addition to helping prevent immediate injuries from falls, reducing the amount of stress to our bodies’ joints is important to long-term health as well. Combined with the safety it provides for children and the increased comfort while exercising, The Foam Factory floor padding is an intelligent investment, whether you’re padding an entire school gymnasium or just protecting your back during sit-ups. 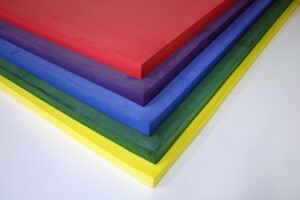 What type of foam is used for gymnastic floor exercise. From my understanding, they typically use a 2 inch polyethylene foam, but I would like to know if this is open or closed cell, as well as the density of the foam. Thanks. What can be used is either 6.5lb density gym rubber or 2.2LB density polyethylene foam. Both of these foam types are closed cell foams.